Bankers in Guayaberas huddled in Acapulco to roll out a new online payment system and to pledge financial inclusion. But all anyone could talk about in the corridors was the nation’s ailing oil company, Pemex, and a new plan to try and save it. It began with news reports that Mexico would dip into a stabilization fund to pay some Pemex debt. Then Deputy Finance Minister Arturo Herrera told Bloomberg News this would give the state-owned oil producer as much as $7 billion to face debt obligations over the next year and a half. Central bank Governor Alejandro Diaz de Leon was bombarded with questions from media about the fund story, which graced the front pages of financial newspapers Friday, and it was followed by research notes from banks. The new payment system known as CoDi became second-tier news. Diaz de Leon chose to respectfully deflect reporters’ queries until more details were on hand, which are expected in about two weeks. He told Bloomberg News he’s looking for “sustainable” solutions to Pemex’s ballooning debt load. Finally, Finance Minister Carlos Urzua explained that he’ll seek to change the law so that the Oil Revenue Stabilization Fund can be used to prevent Pemex from having to go to market to refinance its debt this year at high costs. Bond yields have soared following a two-level credit downgrade by Fitch Ratings in January as the oil major’s debt load hit $108 billion. This could mean using $6 billion to $7 billion from the fund, Urzua said, although the plan is still being considered. After all, if rescue announcements themselves help Pemex bonds, refinancing might end up being more doable this year. Longer term, Urzua said Pemex must produce a credible business plan, which he expects late in April or early May. “Pemex must show that it really has a very robust business plan in the mid- and long-term,” Urzua said. 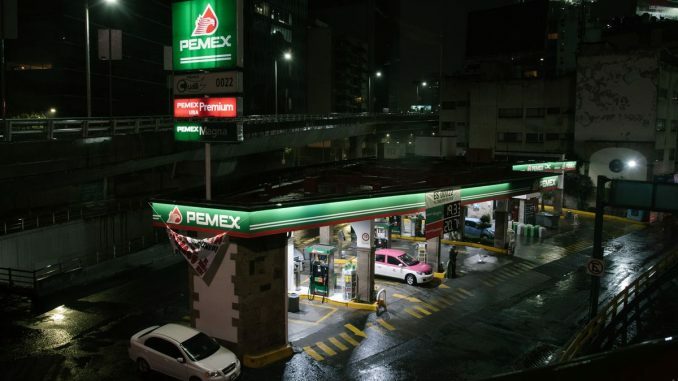 “At this point, the risk perception that global investors have about Pemex isn’t the best,” he said. The reaction to the plan has been mixed. Banorte said in a research note that using the fund known as FEIP will help generate confidence among public investors and the $7 billion would cover 73 percent of 2019 maturities. JPMorgan Chase & Co. wrote it represents a longer-term aid for the company but implications for Pemex’s credit ratings remains uncertain. Yields fell on Pemex dollar bonds due in 2027 to as low as 6.20 percent, the lowest in five months.